A huge thank you to volunteers from Cross Current Church for reaching out to partner with us on the Sunday, April 29 cleanup of the woods between Beech Road and Church Road. Check out the photos to see the amont of trash collected. We’ve got the numbers on our Project Clean Stream effort for 2018! THANK YOU to our partners and sponsors. Details of our efforts below. That’s 2.896 tons or 5,792 lbs of trash! We also have an event photo album on Facebook to share. We’re not done – with thanking people, or with the trash. In no way did these record numbers of volunteers and recovered stuff cover the entire planned stream area. Nor is it a major part of the trash that’s out there. This was a volunteer event with sponsored supplies. If you haven’t yet, please scroll down to join Sterling Foundation – only $20 a year, use the PayPal button – and if you’re out walking and see trash? PICK IT UP! 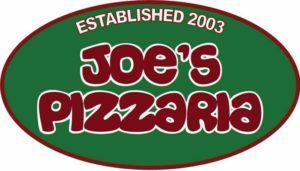 Joe’s Pizzaria Sterling fed 76 ravenous volunteers on a cold, blustery day. Delicious job, Moe and the team! Nana Chroninger provided co-funding and encouraged us to make this event waste-free for drink containers with snazzy green reuseable carabiner clip bottles. A Foundation first! All Dulles Area Muslim Society (ADAMS) put out the call to their dozens of Boy Scouts across two counties and made it possible to branch out to a second stream, Muddy Branch. There’s still more to do towards the Fairfax County line and we’re stoked to have these community partners on call. As always, Kevin Chroninger and Mark Lenko of Keep Loudoun Beautiful were our equipment & logistics kingpins. Nearly 40 students from here in Sterling including Park View High School‘s Campus program, NHS, Science Honor Society, and Math Honor Society were our core strength crew. 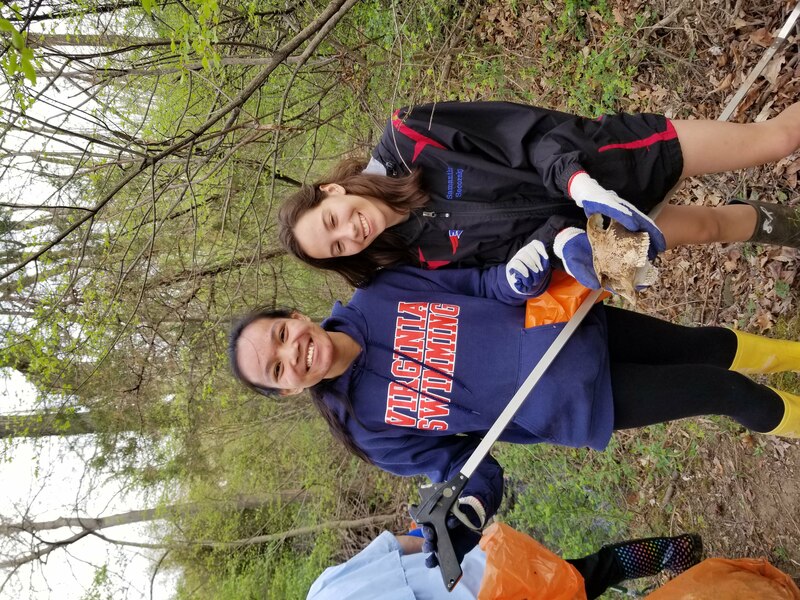 Joined by teens from Dominion and Potomac Falls High Schools, as well as Sterling Middle, these guys and gals run down the stream getting trash out so quickly it’s surprising the place doesn’t vaporize. They refueled and went out in the afternoon again, working down to the wire as rain started to fall. Their faculty team supervisors took time out of their weekends to make it possible, a high-value investment. Go Patriots, Titans, and Panthers! Asurion provided promotional printing services to get our recruiting flyers, posters, and handouts ready. Loudoun County staff, especially Jacqueline Pujol from Supervisor Koran Saines’ office for getting into our trash to help sort out some of that half-dumpster of recycling, while the wind blew. Zoe Irwin and Kristin Brown from Loudoun County Mapping consulted extensively in our planning. Sterling Middle School and Loudoun County Public Schools staff for helping us promote the event along the Boulevard, giving us a central hosting location, and letting us clutter up their front lawn for a day. 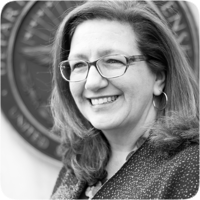 Loudoun County’s Soil and Water Conservation District’s Charlotte DeMolay for working with us on an educational speaker this year, though we had to reschedule. Check out their programs! JB’s Hauling provided bulk metal recovery this year. Need junk gone? Contact them at 571-437-7552 for a free quote! VDOT’s local team again supplied the remaining bulk pickup totaling 1.98 tons. Our appreciation to Sunil Taori and Jerry Compton for the cheerful collaboration. Last but not least, the Alliance for the Chesapeake Bay‘s Project Clean Stream is our umbrella organization for this event. Thanks to Ted Wolfe. They provide some sponsored equipment, but most importantly, they originated and promote the message throughout our region that every little bit helps preserve clean natural resources and a livable environment for all. As you can see in the photos, little bits add up! Stream clean up will feel incredibly rewarding to a community. 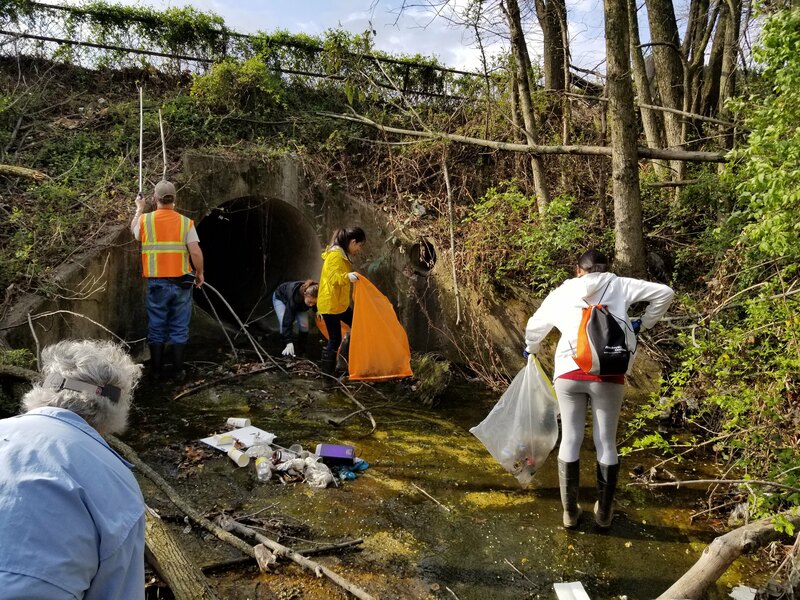 Volunteers who are educated about the clean up through the media will understand and appreciate the sheer volume of junk that you’re likely to find in the creek itself and also along its banks, especially the first time you organize a clean up event or campaign. Plastic is especially harmful to every living creature since it photo-degrades over time, resulting in microscopic plastic particles that basically pollute our environment with toxins forever. The long term results of these projects is that when they are completed on an annual or semi-annual basis, there will be a tendency for less and less trash to be collected. Partly that’s because with the first event, you may encounter years worth of trash. But your first annual clean-up day also establishes an important statement to the community. People get the idea that someone cares about the small streams and tributaries in Sterling. Maybe they will reconsider throwing batteries, construction material and car tires into or next to the creek. The benefits of working toward clean water go well beyond a vague feeling of accomplishment. Because clean water is the law of the land in the U.S., and has been since 1972, Sterling is obligated to do some degree of cleaning streams of any size before sending them on downstream to Broad Run and Sugarland Run and the Potomac.